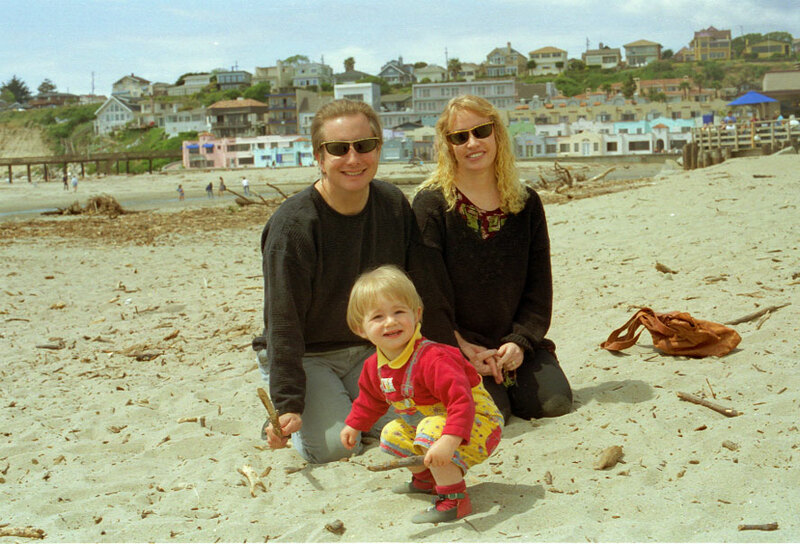 Immediately after our arrival in Santa Cruz, the five of us, the parents, Daphné, Alban and Charles, stayed for two months at this hotel near the beach and Boardwalk, the Blackburn House, while we looked for a home. Occasionally, magazines or web media like Yahoo will list sources of possible stress in a person’s lifetime, and attempt to compare them or rank them. There are terrible life-changing occurrences on these lists, obvious ones like the death of a family member, but it is the more banal events that surprise me. Moving house or changing jobs isn’t always easy, but if you believe these lists they rank up there in provoking stress close behind divorce or losing a loved one. Remember, the lists are not talking about what hurts you, but what stresses you out. We had started out together in France with a lot of stress. Both of us were in the middle of fiery separations, the children were all pretty worked up, Marie-Hélène and her children moved house and changed schools, and of course we were embarking on a new and different relationship ourselves. Russ and Annie Hanlon with Charles during his first visit to California in April 1997. We were exploring the coast, to figure out where we wanted to move our home. 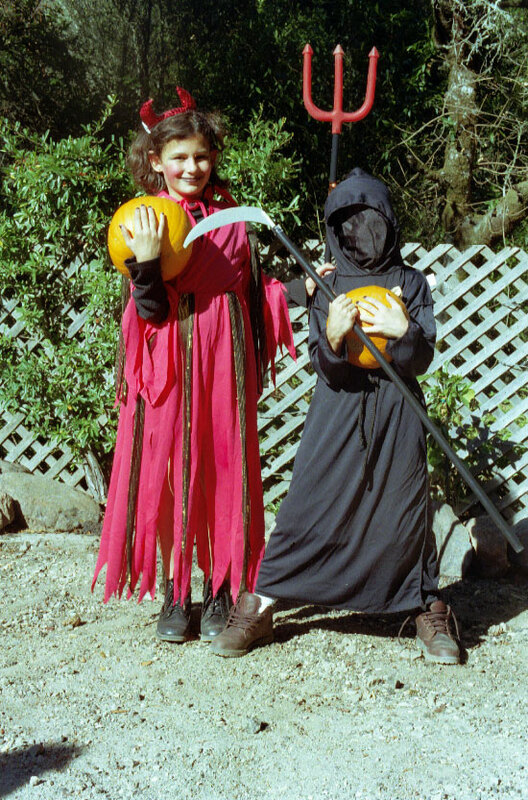 Every birthday for years after we moved to Santa Cruz, they thought to do something special for us. 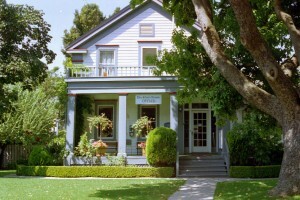 But our initial stress was nothing compared to how we felt after moving to Santa Cruz. It does sound like an exaggeration, but I don’t think that it is: on some hidden level, the combination of so many events during the period 1997 through 2000, some unexpected and some expected, drove Marie-Hélène and me a little bit mad. It was almost all internalized, little or no insanity was being expressed here, but inside we lost something of the straight and narrow that we had shared before. How? First, all our furniture was held to ransom for over three years by one Arnauld Bourlé and his moving company, Tison. Second, the courts separated Nick and Tom from the rest of us for two years. Third, corrupt local prosecutors put a lot of effort into trying to steal money from us. Those three unexpected and draining and long-lasting battles sapped our strength. There were happier times, of course: Marie-Hélène’s and my wedding at La Bellanderie in St Hilarion a month before we left France; and Alex’s arrival in Santa Cruz six months after we arrived here. Kay Tillion, mum’s best friend before she died, came to visit with her husband Charles during October 1997. She and Charles had also been kind enough to attend our wedding. This was taken with the sun low in the sky (hence the wincing) at Capitola Beach. Remember those stress-generating events again: some of them are happy events, some are sad, all are powerful in their own ways. Whatever their emotional color, however expected or otherwise they were, they were piled on top of the expected disorientation of moving house and changing schools, job and continents. That’s what you do when you immigrate. The disorientation was especially the case for Marie-Hélène, Daphné and Alban. Maman was finding her footing in a new world where her children could not speak a word of English: she herself had notions of English as a result of working for years in an international law firm, but inevitably there was a way to go. We enrolled Daphné and Alban in a summer program at a local school to help non-English speaking children, but knew that helping them speak English and feel at home was going to take time. Marie-Hélène doesn’t get frantic, it’s not her way. But the furniture, all her missing clothes, the family heirlooms held for ransom in a warehouse thousands of miles away, that worried her silly. It was as if her invited friends couldn’t make the trip, and at times she felt very alone and bleak. Not all the time: she’s a trooper. But being brusquely and unexpectedly deprived of all that she held dear had an obvious and profound impact. 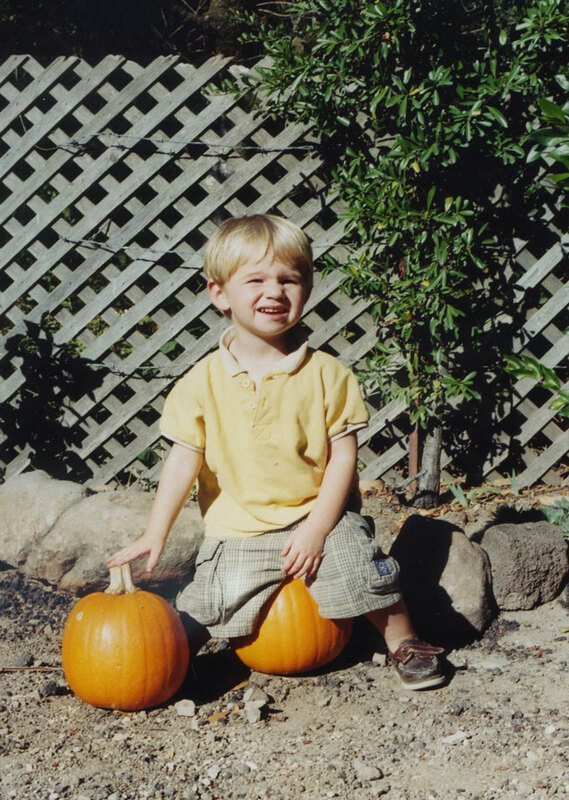 1997 was his first real Halloween for Charles, then two years old. he liked it! 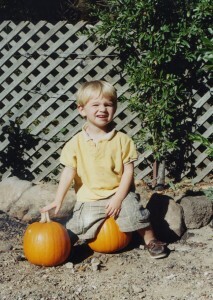 The pumpkins are also props below. I was frantic, at least initially. I spent months chasing after the furniture, trying to figure out what had happened and what could be done about it. We were receiving faxes and registered letters from Arnauld Bourlé, making conniving claim upon conniving claim, in essence blackmailing us to pay his company in order for it to ship our furniture to us. I was researching applicable law, writing letter after letter to first one lawyer in France and then another, pointing out the fallacies and inconsistencies in his crooked arguments, pointing out that we had nothing to gain. The goal was to have the Court order the furniture to be delivered pending resolution of the underlying dispute. Unfortunately, that didn’t work. Based on the various initial pleadings, the Court didn’t know who to believe, and turned our request for quick action down. We all felt terrible as those first months turned into years of missing everything we held dear. Some of the local customs were easier to get into than others . . . here are Daphné and Alban’s thriving during their first real Halloween. For months again, I spent hour after hour, day after day, researching the law applicable to what had happened to Nick and Tom, and writing fax after fax to first one lawyer in France and then another, trying to help the boys. But again I soon discovered here that it was going to take a while to challenge the courts’ decision to change their residence and retain them in France. That too was terrible news. 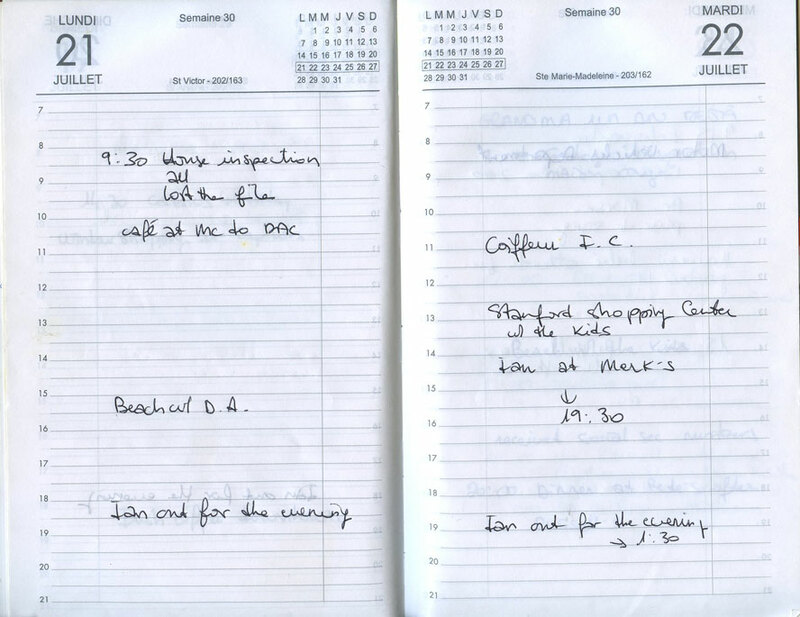 In the interim, I went through a prolonged process of asking the Court to ensure that they were able to visit us in accordance with the court’s own order, which finally happened at Christmas 1997. While all this was going on, we found time to locate and buy a home in the forest outside Santa Cruz, move our meager remaining affairs into it, rent basic furniture for six months, which we hoped would be long enough to get the furniture sent from France, start Daphné and Alban at Happy Valley School, and welcome Alex into this world. The day after we moved in was Charles’s second birthday, which we duly celebrated on the deck, the first birthday in our new home. After two months in a hotel, it felt great to be home. But somewhere the accumulated problems were having their effects on Marie-Hélène and me. One of the more important effects I only discovered recently (2011) reading through 1997’s family diary. While living at the Blackburn House, the hotel where we stayed for the two months until we moved into our new home, the Hanlons let us use their home as a mail-drop and phone and fax line. There was no usable modem at the hotel, and so all email arrived at the Hanlons too. I ended up spending hours at their place on the West Side, just a couple of miles from our hotel, downloading and printing emails, responding to faxes, keeping up the dialog with the various lawyers, motivating them, giving them arguments, pushing, pushing, pushing. 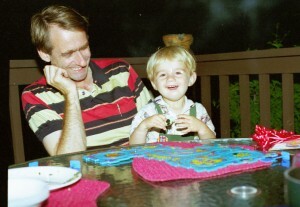 Most of this time was spent in the evening, usually around the Hanlons’ bedtime. They were good sports about that, of course. By focusing on the bad news during the evening, doing what I could to make the news better, I was free during the day to help us all explore and enjoy our new home and new world despite the various impediments. I had been very careful not to spend much time out of the home in France, because I knew how sensitive Marie-Hélène was to such absences as a result of Pierre’s excesses in that department. It didn’t even occur to me to attempt to limit my evening absences after arriving in Santa Cruz, with so much work to do in such difficult circumstances. In any event, I was at Russell’s house working almost every occasion that I was out. 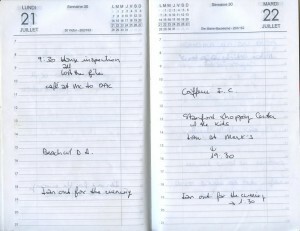 In the 1997 diary, I found several references to “Ian out for the evening” during that period, sometimes with the time that I returned to the hotel. Somehow, all the stress had reawakened old patterns. If the man was out of the house, then he was likely messing around. Or maybe her reasoning was that when the man suffers a major setback or two, he is more likely to wander. Or maybe excess stress had simply brought back her fears of what had upset her so much in her prior life. Whatever the chain of thought, fear of infidelity struck me as the most likely reason for these odd references. 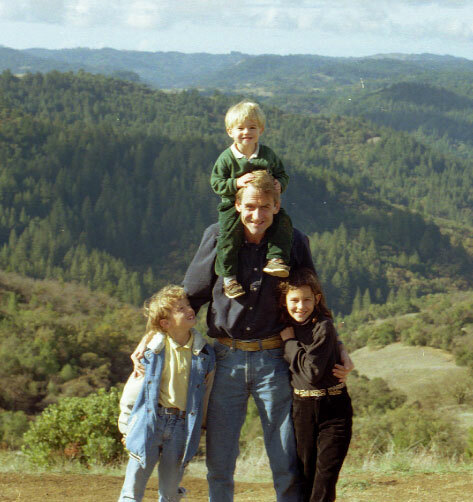 We did find the time initially, before I started real work in Silicon Valley, to take long weekends and explore Northern California. Below is a beautiful state park near Guerneville that we visited in late 1997. There was never an ulterior motive for my absences. With so much to do, most of it unexpected. I wasn’t wandering in any way. Mostly, I was aching a lot during these first years back in the US, missing Nick and Tom and our things. Every obstacle in recovering the children or the furniture felt like a vise squeezing, every delay felt like a kick in the gut. And there were nothing but delays. Justice is never so ponderous and slow as in Versailles when the wronged party is Anglo Saxon! That’s what I often did at the time, blame the Versailles courts. But inside I blamed myself, especially for what happened to Nick and Tom. I was also trying to figure out how to ply my trade. After ten plus years practicing in France, an eternity in terms of absence from US legal practice (which evolves surprisingly fast considering the supposed conservatism of the law itself), I had to learn how business law functioned in Silicon Valley, as well as find work and pay for all this. The legal principles were in most cases the same as I had learned at the beginning of my career in New York, but their application in Silicon Valley a decade later was very different. Edgar looking handsome in Happy Valley, in June 2000 after I brought it back from the trailer park near the law firm. It took a while to find a suitable job. Nine months after arriving, in March 1998, I finally got a lucky break. John Fore, a friend from my first law firm in Manhattan, was an overworked partner needing good help at Wilson Sonsini Goodrich & Rosati. The internet boom was overwhelming his firm and him, and he offered me a slot called Special Counsel. It was outside of the partnership track, but I didn’t care. It was a great job at the hottest high-tech law firm in the world in the middle of a boom. I was going to learn a whole bunch! I felt enormous relief, and before getting down to it quickly purchased an RV. This was the closest I came to real insanity during that initial period in the US. We obviously didn’t have the money to buy such an expensive toy, and so I borrowed almost the entire purchase price. I have a particular penchant for RVs and needed something to counteract all the grief and swirling conflicts surrounding our arrival. 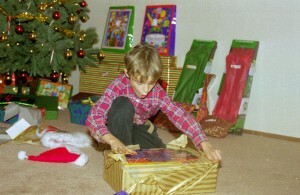 Another shot from Christmas 1997, this time of Alban opening one of his presents on Christmas morning at home. Not having yet found a job was not going to interfere with the children’s Christmas! 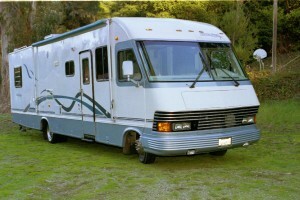 Oddly enough, the RV, christened “Edgar” by Marie-Hélène, became useful for work. The hours at Wilson Sonsini were impossible. I billed more time in 1999 than in any other year before or since, a little under 3,000 hours. What made these hours feel longer for me was my one-hour each way commute. As the months of crazy hours accumulated, the return half of the commute became dangerous. I was dog-tired and more and more often at real risk of falling asleep at the wheel. After a particularly hairy midnight drive home, I parked Edgar at Trailer Villa, a Redwood City trailer park just of highway 101 and only about 15 minutes from Wilson Sonsini. It was a lot cheaper than renting an apartment in Palo Alto, then extremely expensive because of the effects of the internet bubble on the local housing market. I slept in the RV from Monday through Thursday nights for several months, until the hours at the firm became more manageable. You can imagine how my often staid lawyer colleagues reacted to this admittedly odd move! 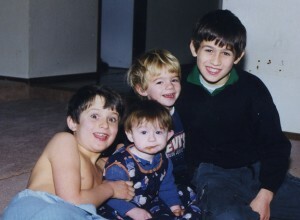 Nick and Tom visited our empty house (our furniture was still in Arnaud Bourlé’s warehouse) again for Christmas 1998. Alex was not yet a year old, and Charlie was three. Looking back form 2011, I wonder if these continuing absences had continuing effects on Marie-Hélène, similar to the effects of my earlier evening visits to the Hanlons. The regular job gave us a good income, finally, which took away some of the stress that we had been under, but our lawsuits in France, both the furniture and Nick and Tom, kept coming. And I was never home. 250 billable hours a month, on top of regular work on our various pending lawsuits, kept me more than busy. I had a modem at home, but no access to Wilson Sonsini’s network and facilities, and so did all the personal “work” at the office too. If my absences at the Hanlons’ house in the evening had been upsetting, were these much longer and more constant absences at the office or in Edgar any less so? Here’s what this long page could have said, if things had worked out differently. As soon as we were married, I gave my love and our children a fresh start in a place where almost the entire world envied us. We found 300 days of sunshine a year in a home on a bright and breezy knoll in a wooded paradise, and stumbled upon a school for the children which genuinely cared. We skied at Lake Tahoe and hiked in Yosemite, each four or five hours away, and people-watched in San Francisco and Carmel, an hour and a quarter and 45 minutes away respectively. The names alone resonate with hope for the rest of the world. Each of us would go on to discover something special for him or her in this wealth of new possibilities. 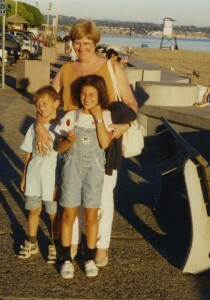 In short, I gave my love and our children a dream to live and grow in, and they were forever grateful. Shame that it doesn’t read that way, isn’t it?